For over 13 yrs, FIGS has been fine tuning our skills and processes to make our services available to customers and clients alike. While we continue to refine our skills in a variety of disciplines, we always enjoy a challenge. If you don't see something on our site please feel free to ask and we will see what we can do. Bushing to bearing conversion: We can convert any rubber OE bushing to a precision spherical bearing provided we have accurate data. Custom Poly bushings: We have raw stock that we can make nearly any bushing interface via machining. Currently we are offering bushings installations and custom vehicle build projects. 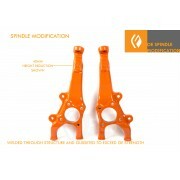 Derived from our years of drift suspension design we can build custom complete steering kits for any vehicle. We call this Service "PROAngle CUSTOM". Pricing varies depending on development cycle time and vehicle goals. 8 ft press brake capability. Aluminum and steel bending up to 0.25", thicker bends via fabrication. Transitions from prototype to volume manufacturing. 3D scanning, CAD conversion, Feature generation we can take most objects and extract major features and convert them into parametric models that can then be transitioned to manufacturing.